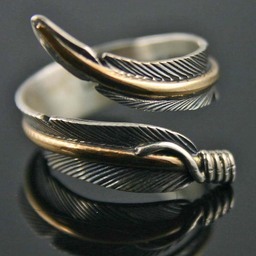 This ring is crafted with a feather pattern all around its edge. It acts exactly like a feather fall spell, activated immediately if the wearer falls more than 5 feet. The affected creatures or objects fall slowly, though faster than feathers typically do. Feather fall instantly changes the rate at which the targets fall to a mere 60 feet per round (equivalent to the end of a fall from a few feet), and the subjects take no damage upon landing while the spell is in effect. However, when the spell duration expires, a normal rate of falling resumes.